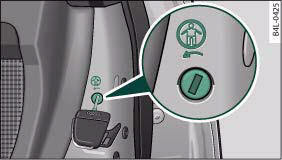 The child-proof catches prevent the rear doors being opened from the inside. The rear doors are equipped with child-proof catches. The child-proof catches are only visible with the doors open. Take the emergency key out of the remote control key. – Turn the key in the direction of the arrow ⇒ fig. 48. – Turn the key in the opposite direction of the arrow. When the child-proof catch is engaged, the inside door handle will not function, and the door can only be opened from the outside.